“On our doorstep, Ishani and her Waverley Ensemble play inspiring classical music that works beautifully in the intimate setting of St Christopher’s Church. Musicians with experience of playing in world renowned orchestras perform well-known and more obscure pieces. 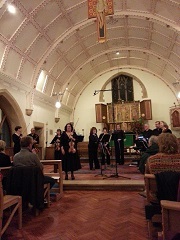 We are so fortunate to have such high quality music locally in Haslemere, and I always look forward to wonderful music evenings with Ishani.” A.H.
Concerts take place at the beautiful St Christopher’s Church, Haslemere, well known for its fine acoustics which lend themselves to music of the baroque era. The church has been beautifully restored and offers excellent acoustics for The Waverley Ensemble. Ishani crafts each concert individually creating an evocative atmosphere and bringing new interpretive understanding to the composer’s work. 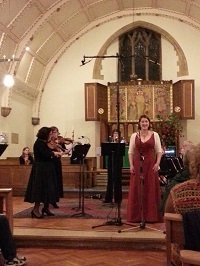 For example The Waverley Ensemble’s recent programme included Autumn from Vivaldi’s Four Seasons. 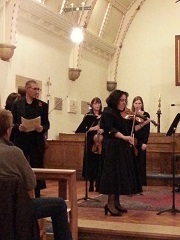 Prior to the Ensemble playing the piece she invited her husband, Cyrus Dadachanji, to speak in the original Italian Vivaldi’s verse that accompanies the work and Ishani demonstrated on violin the parts in the work that had the Italian words next to them . The audience were provided with the words in English. Through Ishani’s wide network of professional musicians, concerts include a variety of soloists, such as sopranos and other vocalists, flautists, oboists, baroque keyboard players and others . Ishani Bhoola is based in Haslemere, Surrey. Together with The Waverley Ensemble, she creates, directs and presents varied, interesting and evocative baroque concerts. The interval enables the local audience to meet each other and a cash bar offers red and white wine, tea and coffee. Concerts by the Waverley Ensemble gives forthcoming concert dates with music programme and tickets can be purchased at Concert Tickets.